Richard Irwin (Belper, United Kingdom) on 4 January 2008 in Plant & Nature. 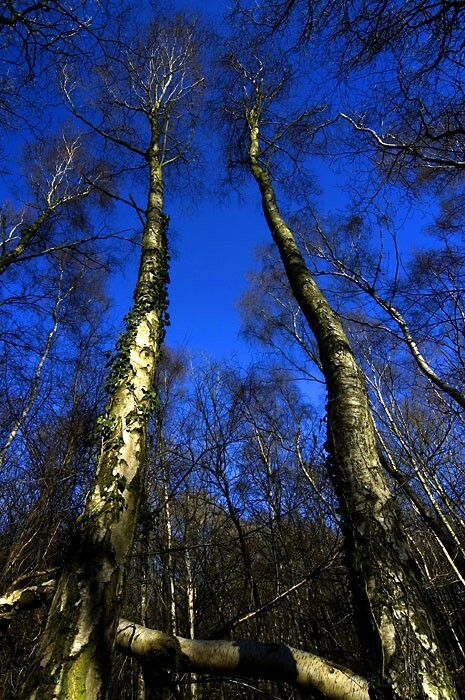 These Silver Birches seem to tower up into the blue winter sky. This image was taken with a 12mm lens. Stunning shades of blue in the sky - the entire compo is wonderful. Of course the blue is nice, but without those long lines of the trees it wouldn't be nearly as interesting as it is. Well done! Nice composition and interesting tree trunks. Beautiful, simple shot - nicely done, rich colors! great angle of view,the deep blue sky adds the extra magic..
Great angle! Love the blue sky! Very impressive deep blue. The 12 mm lens gives fantastic perspectives. Amazing effect. Seems that trees are in 3D. Tall and almost twin trees :). Remarkable, Richard! The contrast between the trees and that stunning blue sky is perfect! lovely job with this image. I know it is not easy to take pics of tall trees like this ones. Awesome job!